It wouldn’t be Christmas at all without the lighting of the Rockefeller Center Christmas tree. 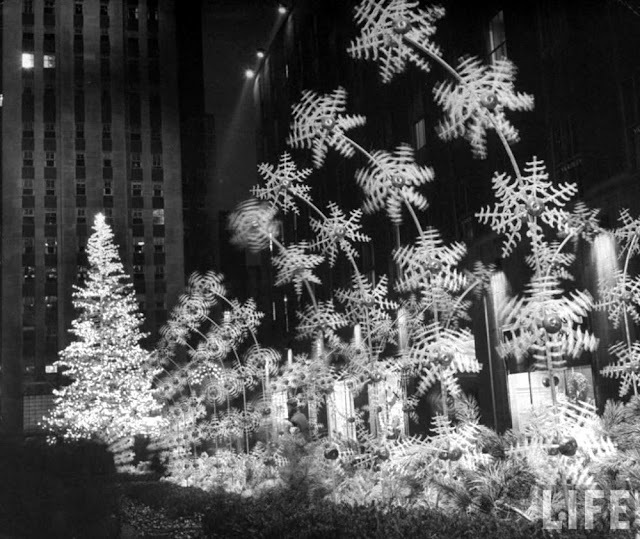 Every year, the holiday display at Rockefeller Center grew bigger, brighter and more extravagant. Sparkling in the distance, a 75-foot silver sprayed Norway spruce glows after its 7,500 bulbs were lit for the first time at Rockefeller Center on December 9, 1949. As if that didn’t grab your attention, the promenade leading up to the tree and the skating rink was adorned with a most dizzying decoration — rapidly whirling plastic snowflakes, 576 of them, illuminated for hypnotic effect. 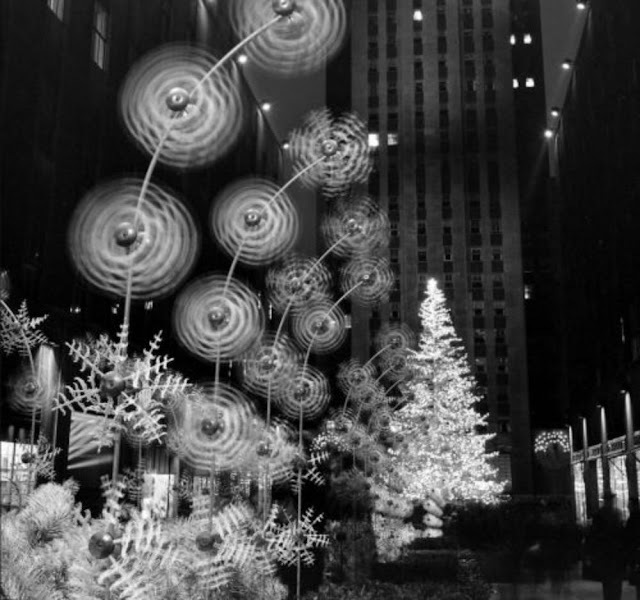 Is it any surprise then that this insane display would later create, on December 19, 1949, “one of the worst traffic jams Fifth Avenue traffic jams in recent years“? Even through police were called out to enforce emergency traffic rules, Midtown was essentially in a state of vehicular trauma until 10 pm that evening. 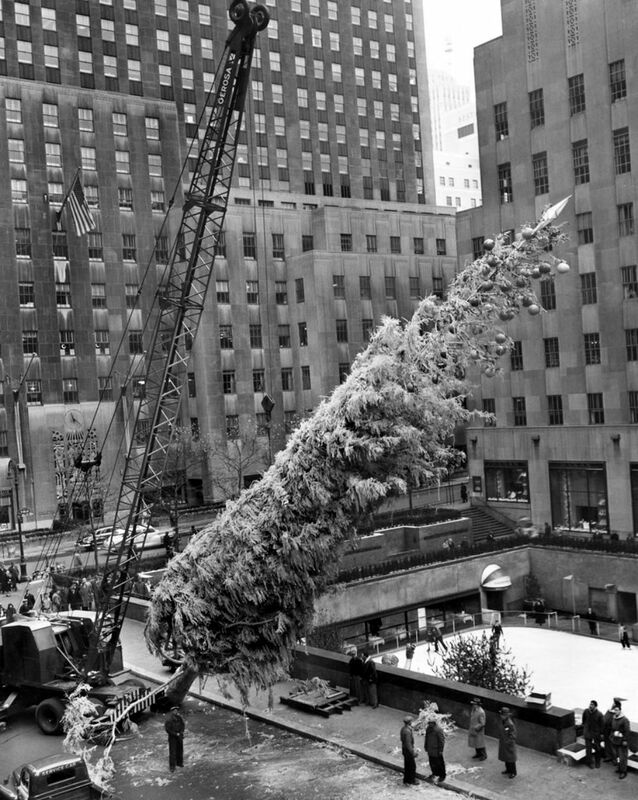 For the 1949 season, the caretakers of the Rockefeller Center Christmas tree decided to go fantastically over the top. Nov. 28, 1949: The annual raising of the Christmas tree at Rockefeller Center. It was 76-footer, eventually adorned with 7,500 lights and 500 plastic globes, but not before getting sprayed with “a war-time product — a white camouflage paint. Two hundred gallons of this sufficed to give the seventy-five-year-old tree its silvery appearance,” reported The Times. 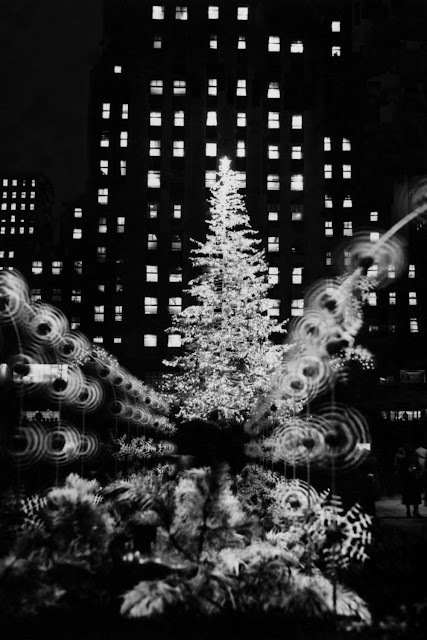 Christmas tree at Rockefeller Plaza in New York on December 20, 1949. 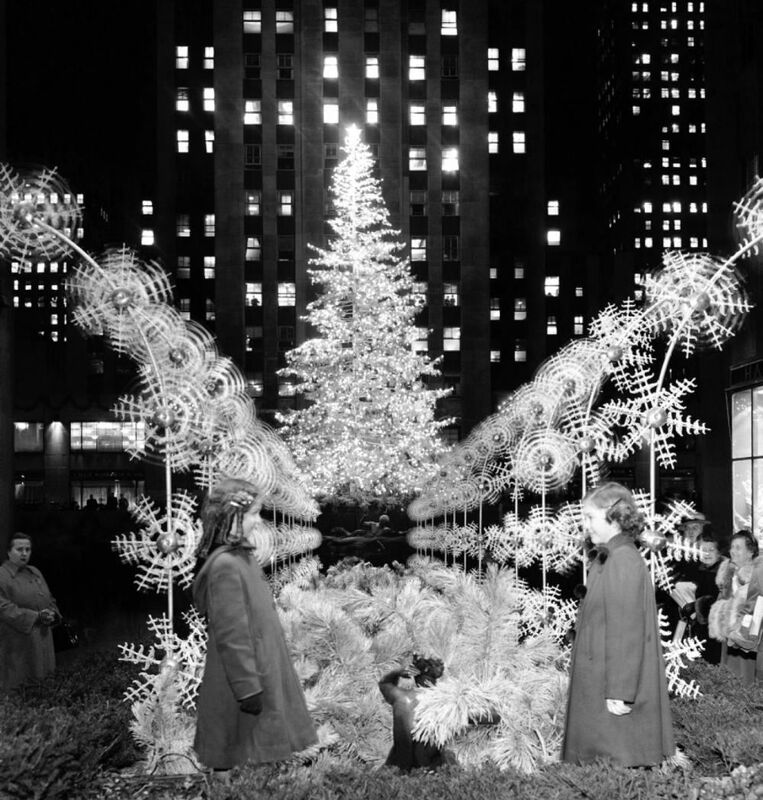 Peggy and Eileen Murphy, daughters of a Rockefeller Center employee, signaled the lighting of the tree on Dec. 9, 1949. 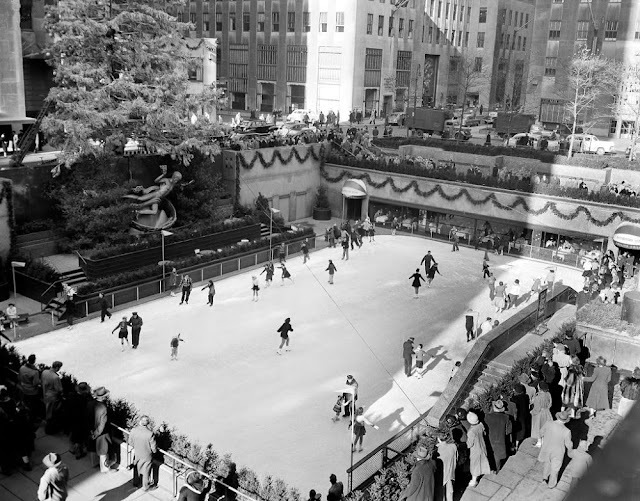 Christmas at Rockefeller Plaza, New York, December 1949. 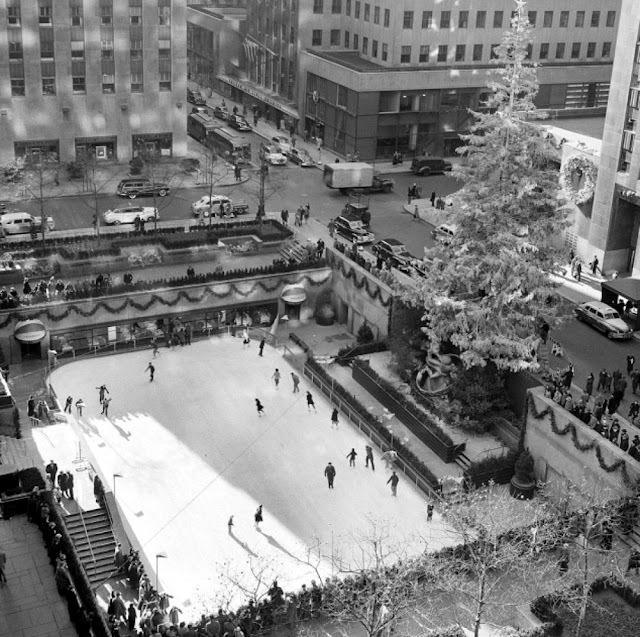 With the famed Rockefeller Center Christmas tree rising above them, skaters glide on the ice at the center's skating rink in midtown Manhattan, New York, in this photo from Dec. 8, 1949. In 1949, skaters glide along the ice at the center's skating rink in front of the towering tree in midtown Manhattan on Dec. 8.